2013 was a trying year. That August, two months after losing my job, death took my favorite uncle. Weeks later on Labor day, it came for my mild-mannered orange tabby. I think about mortality often, more so as my parents grow older. Given these thoughts, playing Last Day of June was more difficult than I anticipated. In a premise born from UK rock musician Steven Wilson’s song and video for “Drive Home,” Last Day of June’s narrative is built around a tragedy. In the first moments of the Italian indie studio Ovosonico’s interactive puzzle game, a couple share a quiet moment by a lake. It’s a picturesque scene draped in gorgeous orange and purple hues. Carl, the game’s protagonist, leaves his wife June’s side to fetch her a blanket from their car. It’s chilly as June’s shivering puppet-like body indicates. Autumn is in the air, and the oncoming storm signals that their peaceful lives are about to be disrupted. 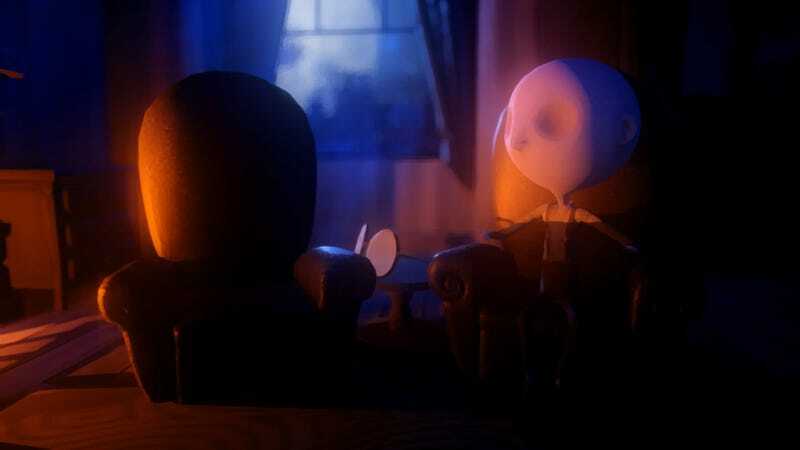 The game is marketed as a love story about loss, and the curious power Carl receives in the aftermath of his wife’s death. It’s one that grants him a chance to rewind time to defy fate. And so, knowing a car crash will take June’s life isn’t a spoiler. But the dread I felt leading up to the tragedy was painful. Last Day of June isn’t a game that’s meant to be rushed. The characters—including the small cast apart from June and Carl—move purposefully, slowly, and although there’s a point in the story where players can control their actions, it always felt as it was on their terms. There’s no need to rush because Carl lives in a world where a quiet life is the norm. The game’s intentionally slow to allow for exploration even when there’s nothing “game-like” to find—at most there’s a flower to pick in that opening sequence. I looked for other things to do as I was hesitant to grab her that blanket, knowing full well that every action to progress the game would bring about June’s inevitable fate and edge Carl into despair. Prolonging the accident also gave me a sinking feeling. All of Carl’s steps felt methodical and heavy. Carl may have had no need to move at warp speed but I agonized over the fact that each footstep trudged ever closer to misery. I felt stressed. I had Carl roam around in the grass but soon landed us back on the path to the car. Although I could have explored further, the world felt too small. Death awaited. I had no choice but to see it through. When my colleague and I spoke with the game’s director earlier this summer, Massimo Guarini expressed his desire to make a game that everyone could emotionally connect to, regardless of whether or not they played games before. The idea of losing a loved one fit that mold and the process of coping is something of a shared experience we’ve all had to deal with. Even if, as humans, we manage our sorrow in our own ways. When I booted up Last Day of June, I didn’t think it’d give me memories from 2013, my parents’ health, and subsequent thoughts about my siblings’ well-being and my own life at the forefront of my mind. But it’s clear the game had other plans for me. Carl’s quaint village with its creaky iron gates, cute apple-filled trees, and charming houses plays host to an impressionist art style. It also gave cover to the more sinister emotions of hopelessness expressed by darker tones and shades of blue for the games’ more somber moments as Carl dealt with his grief. Last Day of June’s puppet-style characters and unintelligible “language”—a made-up one that relies on inflection and body language to convey emotion—added to the fairy tale-like atmosphere where hope to achieve the impossible mixed with that ever-present uneasiness I felt. With this storybook town as a backdrop and its secrets to uncover as a motivator to undo destiny, I took control of Carl—along with his increasing anger and frustration—through multiple groundhog day scenarios to prevent June’s demise. In the game, there are other villagers players get to control. Each are integral in helping Carl’s attempts at altering fate. Over the course of four hours or so, Carl and I used them to redirect the course of history in hopes of a favorable outcome, by rewinding time to specific points in the hours before the accident. I noted how different the game’s pace felt to me once I set Carl’s journey to save June in motion. Nothing had changed save an option to put more of a spring in the characters’ steps which could be triggered by holding down a button. But even so, they still walked at speeds relative to their quiet lives. With Carl’s time traveling abilities, and that glimmer of hope, I felt pressed for time to try and reunite June and Carl. But it didn’t mean some of the characters shared my urgency. In a way, it was cruel being restricted to adhere to these characters’ movements. And they were simply living out their days unaware of the events to unfold, and without being bound to my urgency and nervous energy. As a trade off, I could manipulate a slice of time in their life, replay their private dilemmas, problems and insecurities and readjust certain actions in their lives to attain my end goal. I found it sort of weird, invasive and intriguing but also oddly satisfying given I had the chance to affect their individual stories in the process. Often times, it was for a positive result in their backstories even as Carl and I struggled with this death on our hands. There were moments where I found myself agitated by having to abide by the game’s pace. I felt a few moments of frustration seeing solutions to puzzles I already had answers to but couldn’t do quickly due to the game’s insistence that I play by its sequence of rules. Despite these small grievances, I’ve found myself mulling over Last Day of June. There’s a lot to unpack and days later, my thoughts keep returning to how it crafted its various parts—each thread interconnected to June’s and Carl’s lives resulting in an effective overall execution for an emotionally charged ending I wouldn’t dare spoil here. I came away with a simple, clear life message. One I think players will come to understand, as I did, long before the credits roll. Last Day of June is beautifully told. The game gave me pause whenever Steven Wilson’s emotionally-driven music was expertly weaved into the game’s stop-motion animated-like style. And although I figured out much of the game’s story before it finally unraveled—and acquired a bit more anxiety as I worry even more about the lives of my loved ones and my own—experiencing and sharing in the journey was worth the time and reflecting on my sorrowful memories. All images via PS4 screenshot.